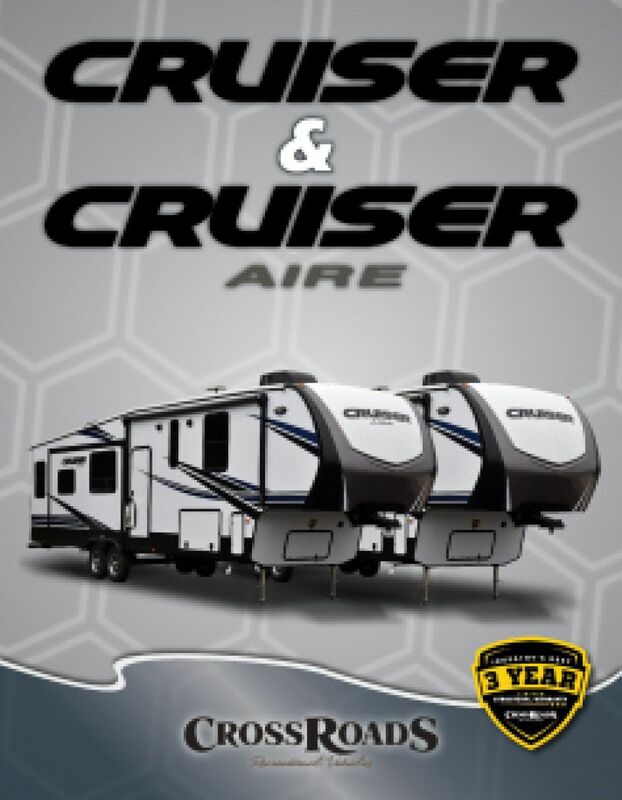 Go camping in style with the 2018 CrossRoads Cruiser Aire 28RD 5th Wheel! Since 2008, National RV Detroit in Belleville has been a top RV dealership in southeastern Michigan and beyond because of our unbeatable service and pricing! We offer all our travel trailers, 5th wheels, motorhomes, park trailers, and more at wholesale prices that will amaze you, with great financing to fit any budget! Come in and see us today to find out just how affordable your dream RV truly is! We're conveniently located at 44700 N I 94 Service Dr Belleville Michigan 48111, and our friendly, knowledgeable staff are waiting to assist you. Even if you don't live near Belleville, or are just passing through Michigan, we have 24/7 delivery across North America and our personalized phone and internet service means we can help you acquire your dream RV at a dream price! So call us today and let us make your dream come true! There's comfy living inside this 32' 7" long, 8' 0" wide 5th Wheel, especially with its 3 slides that maximize the interior space. It's 12' 5" high, so you can stand up, walk around and stretch out! And no matter how bad the weather outside, the modern 15000 BTU a/c unit and efficient 35000 BTU furnace will keep the climate inside comfy and pleasant! A group or family of up to 6 can find refuge at night in this camper! Among the coziest sleeping accommodations is the master bedroom's Queen bed! You want to make sure your family eats healthy, nutritious meals when you're on vacation because you know the importance of a good diet. You'll have no worries in the CrossRoads Cruiser Aire 28RD, thanks to the modern kitchen it features! With its handy 3 burner cooktop and other cooking appliances, you can whip up delicious hot meals morning, noon, and night! And you'll store all those fresh, healthy foods in the 18.00 cu. ft. refrigerator! You'll be able to clean, drink, and cook with plenty of water from the 60 gallon fresh water tank! Do you dread that morning trek through the campground to the cold, damp, crowded public restrooms? Here's the great news! 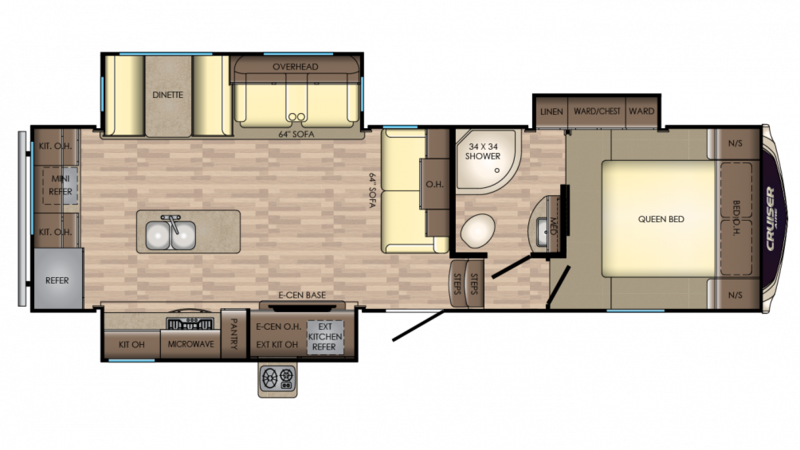 The Cruiser Aire 28RD has its own full bathroom, complete with shower, sink vanity, and Porcelain Foot Flush toilet. You'll enjoy all the comfort, convenience, and privacy of home! What's more fun than grilling outdoors on a great summer day? When you're on the road in the 2018 CrossRoads Cruiser Aire 28RD you can enjoy that treat anytime thanks to the handy outdoor kitchen! It opens easily and you'll whip up tasty meals - anything your taste buds desire!